Pro-Ject DAC Box DS review | What Hi-Fi? The latest addition to Pro-Ject’s Box Design range of compact components is the rather charming DAC Box DS. Available in black and silver, it does largely what you’d expect – accepts digital signals via optical, coaxial or USB inputs (up to 24-bit/96kHz for the first, and 24-bit/192kHz for the other two) and sends them out to your hi-fi via analogue RCA. Displays are still relatively unusual in the world of DACs, especially around this price, so it’s a bit of a bonus that the DAC Box DS has one. The bright green lettering and old-school italic font lend a pleasingly retro feel to the whole thing, but we can’t help but think that giving around half of the display over to the letters ‘D-A-C’ is rather a waste – everything else is crammed into the other half, and only the currently selected input is readable from any sort of distance. 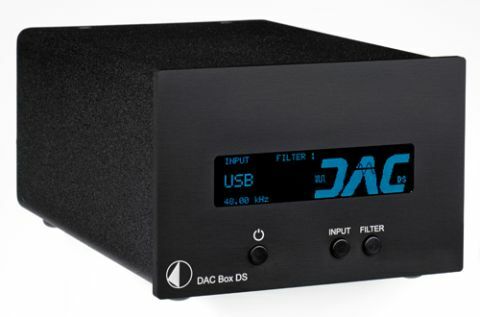 Of course, we’re more concerned with what we hear than what we see, and what we hear from the DAC Box DS is very nice. It’s a smooth, flowing presentation with a very even tonal balance – from deep, weighty bass to clean and clear treble. It’s a delivery in which nothing sticks out, and one that can never be coaxed into harshness – which means it can lend itself to all styles and bit-rates, although you’ll obviously hear the benefit if you go for higher-resolution audio. The only problem for the Pro-Ject is that it doesn’t particularly excel in any area, either. It’s not far behind, but the best in class are punchier, more dynamic and more detailed, and as a result the DAC Box DS isn’t as exciting a listen as you’ll find elsewhere. It is flexible and easy-going, though, and if that’s your sort of thing the Pro-Ject DAC Box DS will do a fine job.